Get in-depth best practices and benchmarks from 332 trailblazing incubators in 64 countries! A well-run incubation program can have a long-lasting impact on both university start-up activity and the regional economy. The best university incubators are hotbeds of talent that produce a wave of successful companies, driving revenues, jobs, and growth for region. But not all incubators produce stellar results. Now you can see what qualities make a top incubator and how these successful organizations differentiate their programs on a wide range of data points. By identifying key elements that go into operating the best-of-the-best university incubators, you can take critical steps to ensure you create a successful incubation program. Plus, when you purchase this one-of-a-kind benchmark report, you’ll receive your own FREE personalized Incubator Benchmark Scorecard to see how your program stacks up against the top incubators in the world. In the new edition of this one-of-a-kind report, over 800 incubators were assessed and more than 300 were benchmarked. You’ll see what qualities make a top incubator and how they perform in comparison to average incubators. This 100-page report measures university incubators using the UBI Index benchmark framework with more than 60 key performance indicators. Discover how your incubator compares on a wide range of data points, so you can spot weaknesses and improve performance. The Global Benchmark 2015/16 report is the only resource that will provide you with your own INCUBATOR BENCHMARK SCORECARD. See how your incubator stacks up against the global average, top average, regional average, sector average and country average. You’ll receive a personalized, intuitive scorecard infographic along with a 30 minute presentation of your performance. No other resource will provide you with this exclusive performance assessment. The Global Benchmark Report is the only resource of its kind, presenting key figures and detailed guidance from top performing incubators that readers can adapt to their own situation. No other resource will provide you with the quality or depth of information covered. 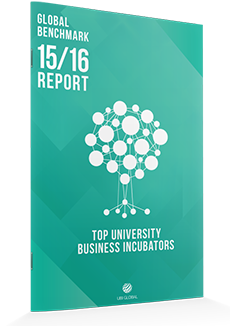 Top University Business Incubators: Global Benchmark 2015/16 is the latest report from UBI Index, a pioneer in measuring the performance of university business incubators. Based in Stockholm, with an international research team, UBI Global has successfully turned this third edition of the global benchmark report into a valuable collection of practical insights for incubation managers, governments, and investors. The author of Top University Business Incubators: Global Benchmark 2015/16 is Dhruv Bhatli, a Paris-based researcher and entrepreneur who is a company principal and spearheads the research and product development at UBI Global. He is also the author of numerous research papers for internationally reputed journals while concurrently teaching at management programs of numerous European business schools.